The adoption fee covers the spay or neuter, all shots, worming, teeth cleaning, leash & collar, and transportation to our adoption coordinators house in Virginia Beach. 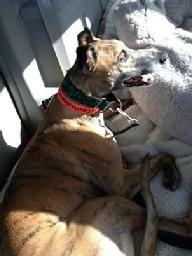 The dogs we place are currently coming to us from the track adoption kennel in Birmingham, Alabama. The adoption process starts with filling out the adoption application below and sending that along with the adoption fee to our adoption coordinator, Gay Latimer. Once we receive your application we will check your references and schedule a time with you for a home visit. The home visit is for us to advise you as to any possible things that might endanger the greyhound as well as assist you in identifying a place to baby gate the dog while you are gone. Typically the greyhound will settle in pretty quickly at which time you can decide how much free reign of your house that you wish to allow. After references are checked and the home visit made, we begin working to match the right dog with your family and lifestyle. The information you provide on your application and in conversations with our adoption coordinators help us communicate to our partners the type of personality you are looking for in a greyhound. This includes whether or not you need a small dog or cat safe greyhound . The more information we have the better job we can do working with the our partners to match the right dog to you. Once a dog has been selected for you we will notify you and begin working to coordinate the transportation. The kennel we work with provides dogs to adoption groups up and down the East Coast and typically makes runs once a month. Our volunteers meet the dog hauler at a pre-arranged meeting area to pick up the dog(s) that are coming to our group. We strive to provide you with as much notice as possible on when we can bring the dog in and as soon as we have word on when the dog will be arriving you will be notified. The entire process can take 4-6 weeks. On adoption day you will pick your dog up at the adoption coordinators house in Virginia Beach. We are here to support our adopters through the process and afterwards as much as needed. Our adoption group also sells raised dog bowls, fancy collars and dog coats should you need them. We encourage prospective adopters to come out to one of our local meet & greets where you can meet other adopters and volunteers and their greyhounds. Please check our calendar of events for more information. Dog hauler truck leaving the rest area after making the drop-off. JS Devilsslammer on the final leg of his journey home. Picking up Greys at the Norfolk airport 2 for us and 4 for Pa.